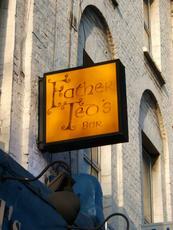 This pub is now renamed Slatterys , this being the name of the licencee. The name and the baseball cap wearing blokes sitting at the tables behind the railings at the front would put a lot of people off, but this place is a harmless enough shop conversion pub. There is no real ale and the generic draught selection would suggest that it has not differed since the good old days of Father Ted�s. Apart from a few locals dotted about and a group of lads on the pool table it was pretty quiet, but I decided to have a half of Guinness as there was a sickly sweet smell wafting through the pub and Knuckles the Hampstead Heath night rambler was sitting at the bar. This place isn�t that bad, but there are better pubs nearby so I doubt that I�ll ever return. 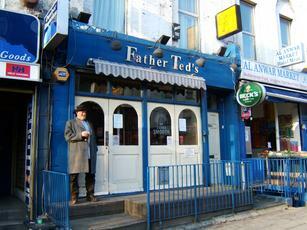 This bar contains the real people of the area not the pseudo trendies who have ruined most of camden's pubs . The beer is reasonably priced Guiness and lager being the main sellers . The pool table is very popular and there is a fabulous juke box . Now called the 3 Lions (so that's Irish and English covered in the last year - look out for name changes to the Leek and Daffodil and the Robbie Burns in the near future). Strange pub, not quite as bad as it first looks. Very odd mixture of customers, but friendly enough. Many better pubs nearby though.